Un coup de dés jamais n’abolira le hazard: Image. (Antwerp and Cologne: Wide White Space and Michael Werner Gallery, 1969). 32 pp. Artist’s book, etc. 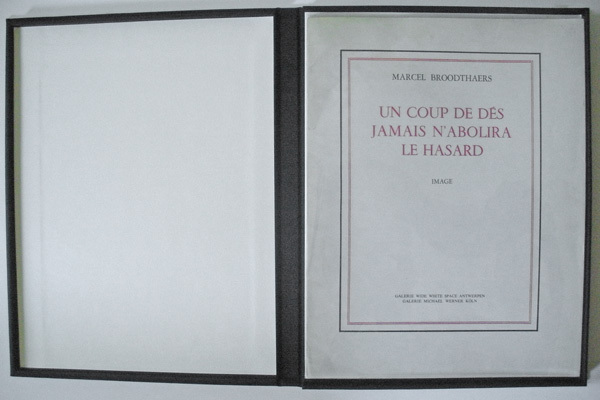 The book’s colophon reads as follows: “The model of this approximative image is the first edition of the poem, Un coup de dés jamais n’abolira le hasard by Stéphane Mallarmé published in 1914 by Librairie Gallimard.” The book as vessel was a great object of fascination for Broodthaers — indeed, one of the artist’s central concerns, a fact that has not been fully appreciated by the artist’s critics. He did not simply employ the book to fill with ideas or as an alternative distribution vehicle (as did most others makers of artist’s books from the 1960s and 1970s), but the Belgian was fascinated — like Mallarmé — by the diminishing poetics of mechanical printing, and by the form of the book itself. Broodthaers frequently explored the book as “an object of prohibition” and Un coup de dés realizes the mystery of this enigma-wrapped-in-a-riddle more consequentially than anywhere else, perhaps, except for his rectified book of poetry, Pense Bête (1964).